We obtained ISO 9001 in Dec, 1997 and became the first ISO 9001 certified company in the transportation business in the Kinki region. It is not common to obtain ISO in Logistics businesses. However, we considered how our transportation service can be equivalent to worldwide standards and came up to our challenge for the certification. We considered and established our work systems and business styles for a year to earn the title. We can guarantee our world-class and high quality services through the certification. We also work as a consultant to teach the know-how of obtaining ISO certification in our business. We obtained ISO 9001 in Oct, 2007 and 10 years later, we obtained ISO 14001. We are always concerned about global warming and climate change, as they are a threat to human life. We contribute to society's well-being through our business, as well as reducing the negative impact on the earth and our environment. We continue to seriously think, how Logistics will be in the future, with our motto of "Eco Logistics and benefits for humanity and earth". We obtained "OHSAS 18001" (Occupational Health and Safety Assessment Series) which is an international standard certification for occupational safety and health management systems, on 10/Dec/2009. With this system we strive to reduce serious accidents which may occur internally, and have become a safety first logistics service provider. Through this activity, we would like to prove our confidence that we, a small-medium sized enterprise, can also maintain and improve the system in the transportation business. Generally, we have common difficult tasks of "the reduction of serious accidents" in the entire transportation business, but the system is very efficient for our tasks. We continuously improve social transportation business positions with the system and also change our business' social images. Osaka license No. 2246 License of general areas motor truck transportation business Kyoto pref. Aichi license No.92 Aichi pref. Shiga license No.884, No.67 Shiga pref. Saitama license No.1387 Saitama pref. Kyusyu license No.1501 Kumamto pref. No. 02600169722 Collection and transportation of industrial wastes service (Type of waste plastics, wood wastes, scrap metals) Kyoto pref. No.7 Warehousing business registration Kyoto pref. Kyoto governor license (General-15) No. 31993 Machinery and equipment installation and construction business Kyoto pref. Sales of Specially controlled medical devices, etc. No. 90604 Sales of specially controlled medical devices, etc. Kyoto pref. N-045 Enterprise to support childcare in Kyoto Kyoto pref. Manufacturer customers have recently required more contract business than temporary staffing business due to their human resources needs. 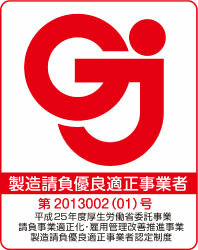 Tsukagoshi Service Co., Ltd. rose to the challenge of being certified with GJ mark (Good Job), so that manufacturers can trust our services regarding the contract manufacturing business compliance system and safety technologies. You need to acknowledge the importance of occupational safety and health matters to protect labour to be certified as a good and proper manufacturing contract business provider. 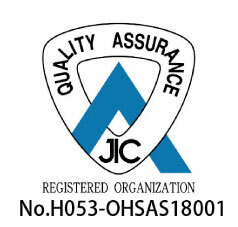 Tsukagoshi group has been operating the OHSAS 18001 system already (external certification is only for 8 departments). We succeeded in obtaining the certification the first time. We strive to improve internal operations as well as advise our customers with what we learned through our experience of obtaining certifications. Shiga license No.221, No.5152 The license of general areas motor truck transportation business Shiga pref. No.120 The registration of warehousing business Shiga pref.